Rick believes he has discovered a cure for baldness and it doesn’t involve what anyone thinks it would. Cheri and Rick revisit the original vision of This Epic Disaster and try to figure out what the hell happened. Is it disrespectful to take a cup of coffee before the entire thing finishes brewing? Rick says yes. Cheri can’t figure out the meaning of one of Rick’s weird dreams, so maybe a listener can. Our Live Beer review is Wild Heaven Beer’s Ode to Mercy Special Winter Ale. 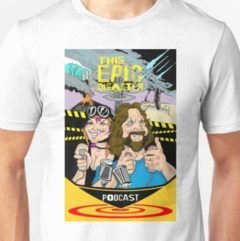 In this episode we steal a regular feature from our other podcast. We’ll be doing a Live Beer Review in each episode from now on. For this episode we review Nitro Vanilla Porter from Breckenridge Brewery. Cheri gets a new car to replace her former vehicle with the nonexistent brakes. Rick has been working on an art portrait and talks about how that becomes a much more intimate act than one would imagine. Rick and Cheri make their Super Bowl prediction and then introduce a new feature called, “That’s Not How That’s Done.” Thanks for all the feedback this week, friends. You all are awesome! 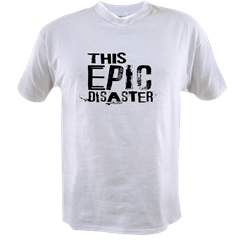 This Epic Disaster 6 – Thrift Store Gift Party! Cheri has come to the conclusion that her new cat might be stupid. Rick has come to the conclusion that he may be unlucky. These things are not hard to figure out. A new feature called “Thrift Store Gift Party” is started on the show and Cheri (arguably) benefits. 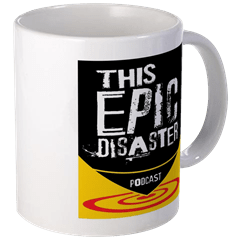 Cheri gets a promotion at work, completely destroying the theme of the podcast about our lives being a disaster. We can always hope that she screws it up. Rick tells stories of job interviews gone horribly wrong.